Most of the Newport Mansions are famous for their extravagant architecture and interiors, but Green Animals gallops off in a different direction. And that's not merely because it's not actually in Newport but in nearby Portsmouth, Rhode Island (find nearby hotels with Hipmunk). Yes, this seaside estate has a house to tour, but it is an afterthought for most visitors--especially children--who flock here to see the magnificent topiary trees sculpted in whimsical shapes. In these photos, you'll see some of the beloved animals that inhabit America's oldest and northernmost topiary garden: a living monument that still captivates. The giraffe is the tallest of the Green Animals. He presides over the Formal Garden, which is also home to a camel, elephant, and lion. These four topiary animals were started in 1901 in a nursery on the property and moved to their present locations in 1912. Through storms--like the Hurricane of 1938, which blew off the giraffe's head--they have been lovingly maintained and recreated for visitors to appreciate. The topiary garden at Green Animals features about 80 sculptured trees and shrubs, and not all of them are animals. Many are geometric designs, such as this intriguing spiral. The geometric and ornamental topiaries are created from English boxwood and California privet. This pair of teddy bears, added to the topiary garden in the 1970s, is made of yew. Kids especially love these playful Green Animals. 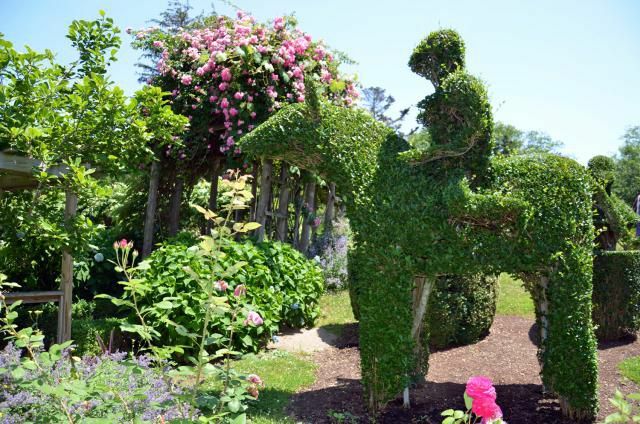 The unicorn is the only mythical beast among the menagerie of creatures that make their home within the topiary garden at Green Animals, one of the often overlooked Newport Mansions. It made me exceedingly nervous when my daughter moved in close for this photo op. With one unfortunate move, he could lose his magical horn and become just like all of the other animals. In addition to the famed topiary trees, Green Animals is also home to other historic and redesigned gardens, including annual beds and a perennial border, a vegetable garden, a cutting garden, a Dahlia Display Garden and a Damask Rose Garden that existed on the property even before Thomas Brayton purchased it in 1872. You'll also discover fruit trees, a fish pond, and a Pet Cemetery, where beloved family dogs are buried. Of course, it is the topiary animals that most visitors come to marvel at and photograph. According to this history of Green Animals, the camel--one of the four original beasts in the Formal Garden--was the very first project that gardener and caretaker Joseph Carreiro undertook. He was inspired by the image on a package of Dromedary Dates in a gift basket from the estate's owners. I love that story: It's a reminder to look for inspiration in everything that comes your way. The Rhode Island red rooster, sculpted of yew, is one of the newer topiaries to join the Green Animals zoo. It was first created in the 1970s. While the topiary and other gardens at Green Animals in Portsmouth, Rhode Island, are the estate's big draw, a visit to the stately Victorian summer home built between 1859 and 1867 for Amasa Manton and purchased in 1872 by Thomas Brayton is also a must. Though more modest than some of its fellow Newport Mansions, the two-and-a-half story residence is worth exploring in particular because its second floor now houses The Preservation Society of Newport County's collection of antique toys. Where Can I Take Free Animal Photos on Long Island? Go on Safari in... Connecticut!